The City of Jasper is a great place to do business and is very interested in the future of your business. Your business's future growth is a direct benefit to the economic development of the Jasper community and it is vital that we work together toward that goal. We have comprised a list of considerations as you begin your business venture. The City of Jasper offers a tax phase-in (abatement) program for qualifying businesses. Property tax abatement in Indiana is authorized under Indiana Code 6-1.1-12.1-1 et. Seq. in the form of deductions from assessed valuation. Property owners in a locally-designated Economic Revitalization Area (ERA) who make improvements to real property or installs eligible new or used personal property may qualify for tax abatement. For a complete overview of the Tax Phase-In Program, please visit the Tax Phase-In page. Before selecting a property for your business, discuss your site with our Department of Community Development & Planning to see if your intended use is permitted - keep in mind, parking and sign restrictions and zoning history. Various permits may apply. The Jasper Municipal Utilities, under control of the Utility Service Board, provides Electric, Water, Natural Gas, and Waste Water services to business in the City of Jasper and, in some cases, the surrounding area. The City of Jasper is a business-friendly community. To this end, we are using our website to better serve as a connection point to our partners in economic development. The following organizations are wonderful sources of information and support as you establish and grow your business venture. Visit their websites and see everything they have to offer! Dubois StrongTM is Dubois County, Indiana's, economic development source for innovative entrepreneurs and thriving businesses. Specialized programs, tailored services and keen business mentoring support local business growth while an abundance of skilled labor, infrastructure, coast-to-coast logistics and distribution make Dubois County advantageous for start-ups and relocations. Our philosophy is to make a business start-up, an expansion or a relocation as easy and as user friendly as possible. Our mantra is simple: Let's Talk! Looking for a right-to-work state with all the right resources, business incentives, low corporate tax rates and AAA credit rating in place to reach your full potential? Indiana has it all, in a central location at the crossroads of America, with an atmosphere that feels like home. If you're ready to bring your business to a state of higher profits, there's no better place than Indiana. 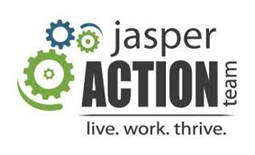 It is the mission of the Jasper Action Team to act as a sounding board for our community. We will take a proactive and non-political approach in addressing Jasper's needs. Our main focus will be to act as a catalyst in order to continuously improve the quality of life that we enjoy in our community. The key ingredient to the success of the Jasper Action Team is input from a diverse group of citizens. By viewing concerns and needs through this community perspective, we will make sound recommendations and help develop long-range, workable solutions to the changing issues that face Jasper. A visual concept of the proposed use of the Hoosier Desk area, July 6, 2015.